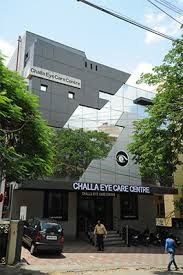 Challa Eye Care Centre Hyderabad is one of the best Eye Hospital run by Dr.Ravi Prasad Challa, who is one of the leading Eye Surgeons in Hyderabad, has 23+ years of experience in the field of Eye Care. His primary interests are CATARACT and REFRACTIVE SURGERY(LASIK). In Challa Eye Care Center the motto is simple, be always at the forefront of technological advances in Cataract & Refractive Surgery. At Challa Eye Care Centre Hyderabad, all our Eye Specialists believe that our business is to deliver Quality Eye Care at an affordable cost. Who We Are All our Eye Specialist in our organisation are committed to quality eye care bringing the best and latest in Cataract & Refractive Surgery. He has produced many surgical videos for training Cataract Surgeons from different Eye Care Centre in Hyderabad in contemporary Techniques of Cataract Surgery. His another interest is LASIK (LASIK Laser Eye Surgery is a refractive Surgery done to get rid of Spectacles). Challa Eye Care Center is one of the best Eye hospitals in Hyderabad, bringing to our patients the very best and latest in Cataract and Refractive Surgery (LASIK). This Eye Hospital in Hyderabad is a place for You, offering world class care with state of art infrastructure and techniques while keeping it affordable and Pocket Friendly.